What makes Biotic Oil so SUPER? There are several beauty oils trending in the market of beauty. Some common ones are Jojoba, Castor oil, Moroccan oil and Argan oil. While these oils are wonderful in their own right, there does exist other oils more robust in their nutrient profiles for Hair and skin that are not so known or popular. Why not use an oil or oils that can do more and be used in more than one way? And could there be a specific combination of nutrient dense oils that can help nourish, hydrate, protect and heal your skin and hair? I say YES! 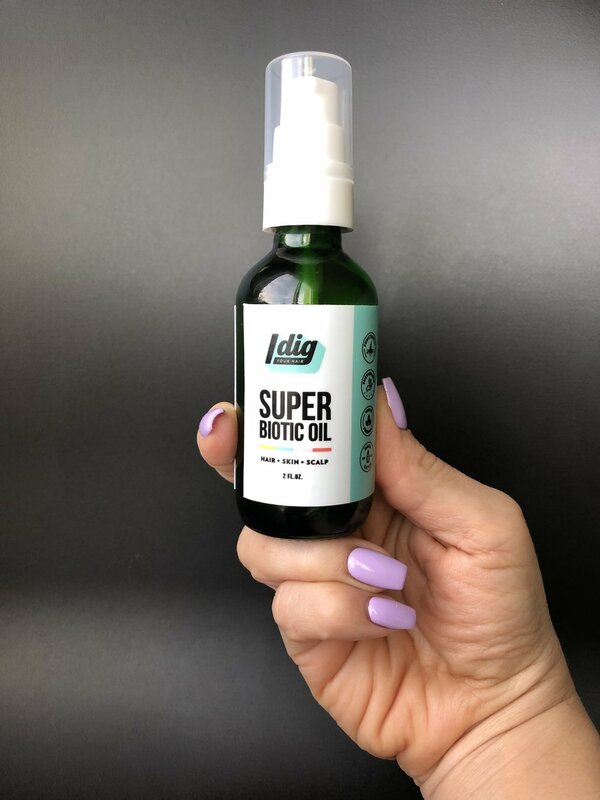 SUPER Biotic Oil was born out of the curiosity and experience of knowing the biology of skin and hair and having a passion for understanding the nutrition that they need to be healthy. Also, realizing simplicity and multi-use products are a need in this over saturated market of beauty products. Aka Crambe seed oil, is derived from the mustard plant with quite a unique profile. It originates in Ethiopia and other parts of Eastern Africa and currently now grown in Europe, South America and the US. 35% of its seeds produce the oil while the rest produces meal and hulls which feeds livestock. It is highly sustainable, stable and naturally unadulterated. Abyssinian oil is an excellent moisturizer. It’s lightweight and absorbs quickly into hair and skin ensuring it works effectively sealing in moisture. The high omega-9 (erucic acid) helps to add luster to dry lifeless hair, boost shine and protect hair from split ends. Abyssinian oil mimics the effects of silicone due to its high omega-9 fatty acid content. This makes it an excellent oil to add in your deep conditioning treatments & prevents frizz. It is supreme in antioxidants. It’s high shelf life means it can be used to help preserve other oils as well. It’s also highly resistant to heat and can be used as a heat protectant before blow-drying hair as well as on your skin in aiding in natural UV protection. It resists oxidation, and it’s loaded with not only Omega 9, but also Omega 3 and 6 fatty acids, as well as vitamins A, B1, B2, B6, C and E.
It’s known to improve texture, reduce inflammation and reduce signs of aging. (Tea seed oil) is cold pressed from the seeds of a wildflower that grows in China & Japan. The composition of Camellia oil is similar to olive oil. It contains about 85% unsaturated oleic acid, omega-3, omega-6 and omega-9 fatty acids, polyphenols and a good amount of vitamin E. Japanese woman have used it for centuries as a key ingredient to hair care and scalp treatments for hundreds of years. It is a fast absorbing oil and perfect for adding light texture to the hair as well as smooths the cuticle of coarse dry hair, promoting shine. It also forms a barrier around hair so it doesn’t dry out. There are 3 types of Camellia Oil: Japonica, Sinensis and Oleifera. The best one for hair, skin and nails is Oleifera. It’s rich in vitamins A, D , E, K , Fatty acids and minerals P, Zn, Ca, Fe, Mn & Mg. The Baobab tree is ranked one of the oldest most majestic of all time. It is referred to as “the tree of life” because of its medicinal and natural food benefits. It is highly sustainable and resilient, providing animals with food and water in the harsh climates it grows in. Baobab oil is very rich in nutrients with one of the highest Antioxidant profiles of any fruit on the planet. It is a rich source of Vitamin C, packed with Calcium, Iron, Magnesium and Potassium, – contains all three omega fatty acids: omega 3, 6 and 9, as well as containing some rare fatty acids and a host of vitamins. It includes vitamins A, D, E and K, as well as dihydrosterculic acid, malvalic acid, arachidic acid, linoleic acid, oleic acid, palmitic acid, and stearic acid. It’s incredibly high amounts of Nutrients and vitamin C makes it a skin regenerator, building up natural collagen. It’s excellent at healing and soothing eczema, psoriasis, under eye bags, stretch marks and parched skin or hair. Baobab is silky and rich but not oily. It sinks in layers of skin and hair due to its molecular profile, as well as the other oils combined with it in Biotic oil. It makes an excellent cleansing oil because of this paired with its nutrients. Chia seeds are one of nature's best sources of Alpha Linolenic acid (AHA), a type of essential omega-3 fatty acid that has many important functions in the human body. A deficiency in alpha linolenic acid and its 'cousin' linoleic acid has been associated with hair loss and scaly skin. It is also high in protein, B vitamins, iron, zinc and copper. This is why it has been used in the treatment of scalp conditions and an aid in growing healthy hair. I was very specific in choosing these oils because I understand the nutrients Hair and Skin crave and need to thrive. And it’s what I often see missing in haircare. There are countless ways to use SUPER Biotic Oil. Remember your skin and hair absorb nutrients too! Feed it what it deserves! After you dry your hair thoroughly, just before you use your flat or curling iron, grab your dry shampoo and spray it thru your roots. Then use your hot tool to style, shake or rake it out and finish off with a bit more dry shampoo. Now you've added some texture, movable hold and it's ready to eat up any oils to stretch out the life of your fresh style. Scroll down for my go to fav! A TRUE Dry Shampoo that instantly refreshes 2nd day hair. Zero-weight spray absorbs excess oil and odor, leaving hair brushable and touchably soft. Sun ower Seed Extract, a powerful antioxidant, helps to prevent damage caused by UVA and UVB rays.